One of the challenges of camping is keeping the food cold. For example, chicken that has gone bad can ruin the entire trip, even if you don’t use it. The smell invades the other food and the cooler. So what cooler to choose? Yeti gets good reviews, theoretically keeping ice frozen for 7 days or more. Of course that’s under ideal conditions … cooler weather, opened maybe two ot three times a day and kept in the shade. We plan on traveling/camping for weeks at a time. So the less times we have to buy ice the better. The downside is two-fold. The price and size. 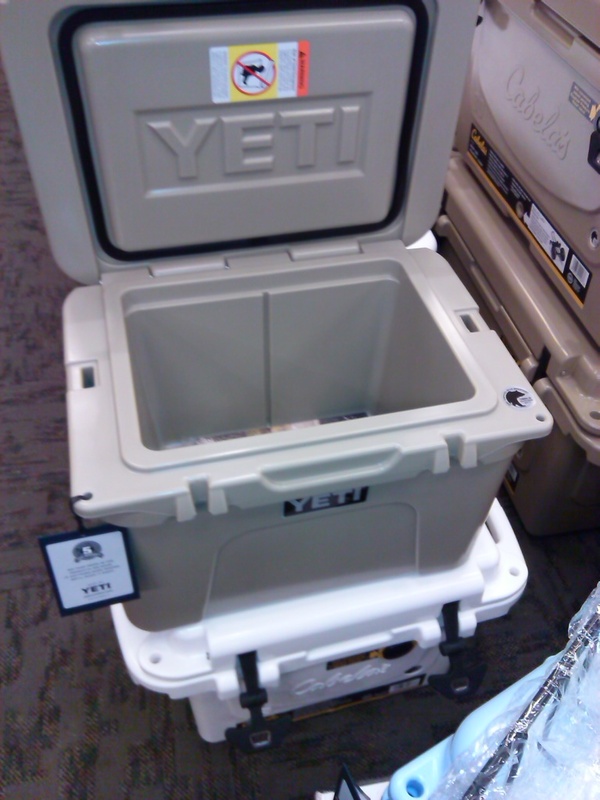 The interior of the Yeti coolers are much smaller than a comparative size cooler of another brand. That extra bulk is to handle the extra insulation. I’d estimate 40% of the bulk is insulation. As to the price, Yeti’s are the high end running from $30 for an insulated mug to over $800 for a 160 quart cooler that measures Length: 45″ width: 18 7/8″ height: 21 3/16″ and weighs 54 pounds empty. The Yeti 20 carries only 14 cans of soda or beer and costs nearly $300. Okay not for us. Coolers that run off the car battery are an interesting option. They claim that the interior of the cooler is kept about 40 degrees below the outside temperature. If the car isn’t running, there is no active cooling going on. Now that works if you’re camping for a day or so then moving on. Not so much if you plan on staying 3 or 4 days in one spot. I suppose you could supplement the cooling from the car by packing some of the interior of the cooler with ice. I don’t think this is the cooler for us. There are refrigerators that run on both electric and propane. These are not appropriate for tent camping but for RVs. 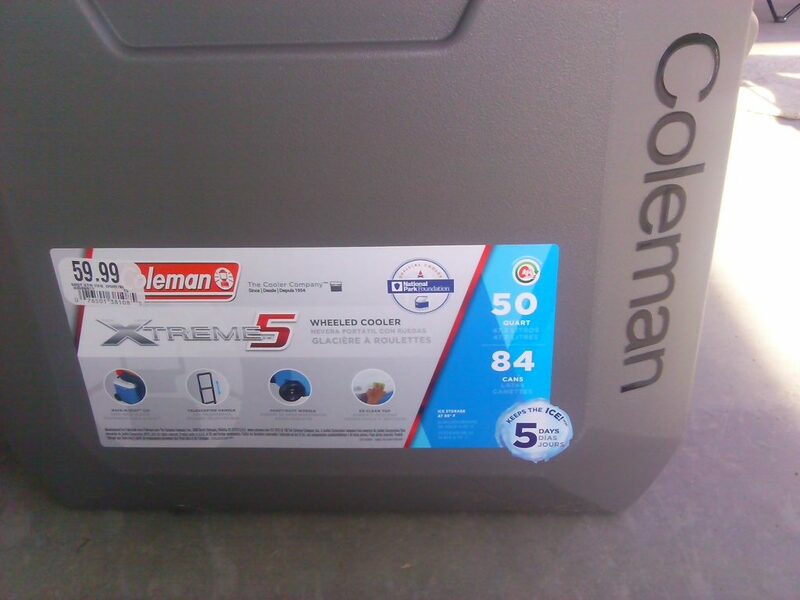 We decided on a Coleman Xtreme 50 cooler that holds 50 quarts. We chose the smaller one because there are only two of us and our four-legged companions, Rose and Kate. And as much as Rose and Kate enjoy ke a cooked human meal, they mostly eat high-quality dog food. Why the smaller size? Coolers lose cold air every time you open it. The less air and the more food, the better. Food or drinks keep cold, while the air escapes. Our goal is 4 days worth of food, which might sound like a lot but it isn’t. 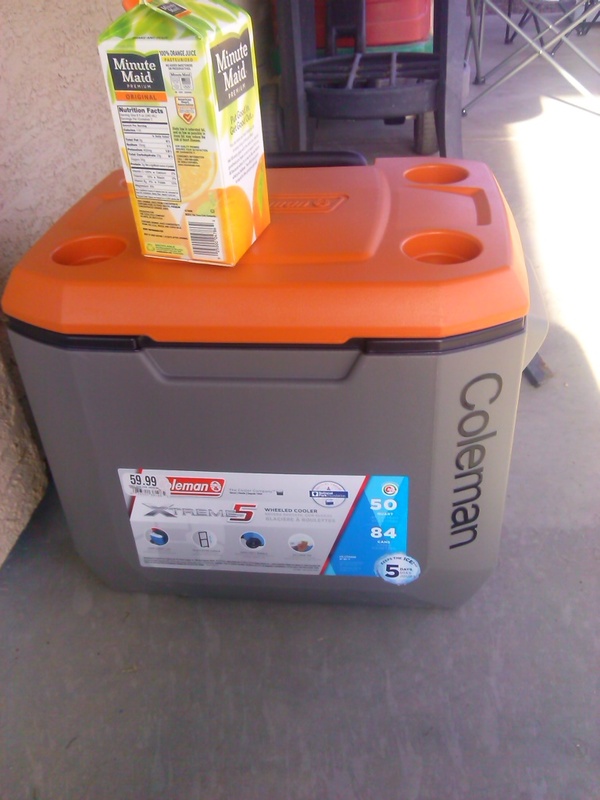 We’ve taken the Coleman Xtreme cooler on three trips now and it’s keeping ice for 3 to 4 days, not 5 like the label says but remember that’s under ideal conditions. In case you’re wondering we pack an extra 5 days of food that doesn’t need to be refrigerated. That way we can handle an emergency or delay. This cooler has wheels and a retractible handle so it’s easy to get around. We put a food box on top of the lid when we load and unload. There is a drain to let out water from melted ice in the back. Isn’t it funny no matter how you pack that ice in so-called, water-tight, zip lock bags you still get water in the bottom of the cooler? The plastic is sturdy. The lid snaps shut with a good push. It is a bit of a struggle to get the lid open when the cooler is empty, but not a problem when the cooler is weighted down by food. Note to Self: Keep the cooler in the shade and not in direct sun. Ice lasts a lot longer.